You are currently browsing articles tagged Norman. Dr Jim Leary has recently been awarded a grant from The Leverhulme Trust to fund a project entitled ‘Extending Histories: from Medieval Mottes to Prehistoric Round Mounds’, which will run until the end of 2017. 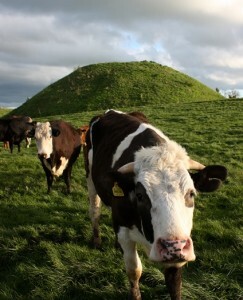 The Round Mounds project seeks to unlock the history of monumental mounds in the English landscape. Neolithic round mounds, such as Silbury Hill – the largest prehistoric mound in Europe, are among the rarest and least well understood monuments in Britain. Recent work by Jim Leary at the medieval Marlborough Castle motte, Wiltshire, has shown it to be a Neolithic round mound which was reused in the medieval period, and raises the possibility that other castle mottes may have prehistoric origins. This research project therefore seeks to uncover prehistoric mounds that were adapted for medieval defence or have been misidentified as later mottes – a previously unrecognized phenomenon that could re-write our understanding of both the later Neolithic and Norman periods. The Leverhulme grant will fund a programme of archaeological investigation, the team (Jim Leary, Nick Branch, Elaine Jamieson, Phil Stastney and Quest) adopting an interdisciplinary approach to understanding large mounds. The work will involving a programme of coring, analytical earthwork survey, scientific dating and detailed environmental analysis, and will determine the date of construction, sequence of development and environmental context of 20 mounds from across England. Click to read more about Jim Leary, Nick Branch, and QUEST. Meet our #UoRWomen – Part 2!